Globally, marine biodiversity is under threat – pollution is on the rise and oceanic life is disappearing. Yet, marine life thrives amidst Singapore’s busy shipping lanes. 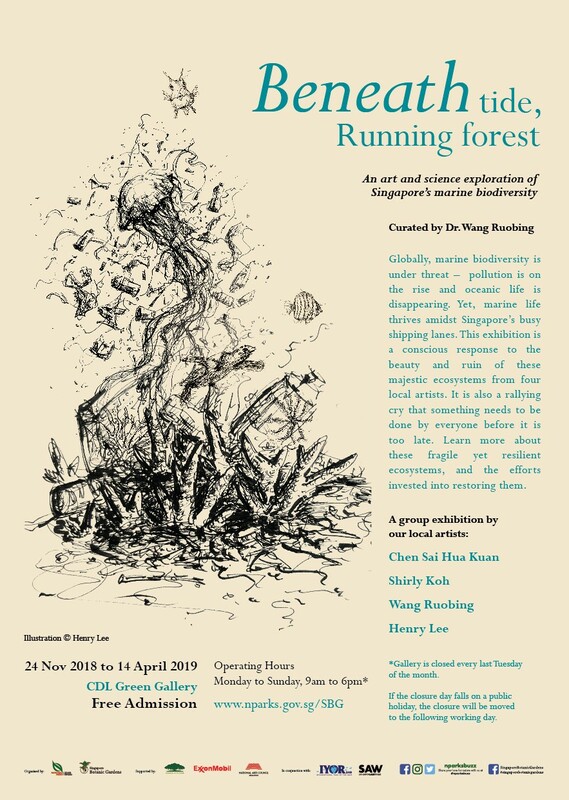 National Parks of Singapore is hosting an exhibition as a conscious response to the beauty and ruin of these majestic ecosystems from four local artists, within the framework of the International Year of the Reef 2018. It is also a rallying cry that something needs to be done by everyone before it is too late. The exhibition will be an opportunity to learn more about these fragile yet resilient ecosystems, and the efforts invested in restoring them. Fringe activities such as film screenings, public talks and exhibition tours will be organised in line with this exhibition. To learn more about the programmes and get involved, visit us on the National Parks website.